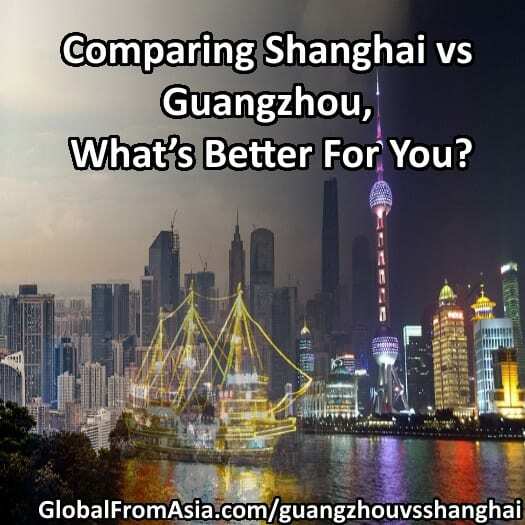 Comparing Shanghai vs Guangzhou, What’s Better For You? Looking for a city to base in China? Narrowed it down to Guangzhou and Shanghai and looking for some help. Let’s get to this! Today I will go through my experiences and the differences I have noticed when deciding to base yourself in Shanghai or Guangzhou city. So living in either of these cities is just as “famous” for your business cards and website status symbol. Yet, something in the back of my mind says if you really want to look “rich and classy” – Shanghai is the top place. If you want to have a mix of East and West – Shanghai is the place for you. For centuries this city has held its arms open to foreigners and their culture. The famous French District of shanghai comes to mind. 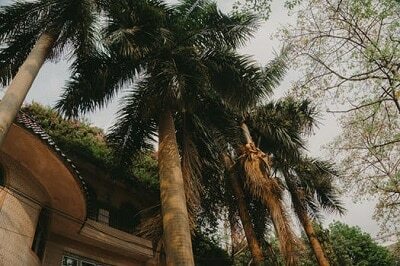 Guangzhou is also diverse with cultures, but nowhere near the level of Shanghai. So if you want a “Western” and “multicultural” experience from people all around the world, Shanghai is your clear winner. If you have the desire to live near your country’s embassy, these cities will likely have representation. One of my drawbacks living in Shenzhen is I need to travel a couple hours to Guangzhou to get to the embassy. But if you live in either of these cities, Shanghai or Guangzhou, you can take a quick subway or taxi to your country’s consulate. If costs are important to you, and you’re stretching every dollar you have – then you need to pick Guangzhou. Even the outskirts of Shanghai are sky high as far as rents and cost of living compared to most places in the world. So while Shanghai is much more “foreigner friendly” and multi-cultured, the costs of living also reflect that additional nicety in your living standard. Are you doing manufacturing business? What kinds of products? Where are the factories located? Most of the time these factories will either be in the South of China surrounding Guangzhou, or in Ningbo port (Zhejiang province). While I’m not actively doing sourcing anymore, most of the time I was flying up to Ningbo and then taking buses to various factory cities (Yiwu market too). So before you pick a city to live in China, try your best to find the highest concentration of your target factories. You will be going there a lot if you are doing anything product related, and it will save you a lot of time and money in the long term. So back to the comparison – Guangzhou factories are rising in cost faster than those in Zhejiang province. But then again, their quality is higher and dealing with them is much smoother. Guangzhou has massive amounts of factories that you can catch even by subway, or a short bus ride. If you live in Shanghai, no factories can afford to be anywhere near there. You’ll most likely need to drive to the Zhejiang province just south of Shanghai and visit the factories there. Its not too far, and many people I know live in Shanghai and do sourcing trips down to the Ningbo area. So this decision point is up to you – where are your current factories? Do you want the cheaper (and less experienced) factories in the Ningbo / Hangzhou / Zhejiang province or you willing to pay a bit more for a higher quality and more experienced factory experience in the south of China (Guangzhou, Guangdong area). This is a tricky decision, and most likely as your sourcing business grows, so will your traveling between these factory areas. Many people are so excited to tap into the growing Chinese market. Where should one base their operations? If you were to ask me, I would straight away say Shanghai. As mentioned earlier, it is such an open market to all sorts of businesses and foreign business models. The people there really welcome Western culture. On top of that, a ton of the marketing and media companies are based in Shanghai. I have seen countless people in the South of China begging to find a quality Chinese internet marketing company to work with. In Shanghai, these marketing firms are everywhere. Well, it is a “trendy” place to live, and tons of MNC (Multi National Companies) bring their creative marketing talent here. Over the years, more and more marketing agencies have clustered here and work on the import process of goods and brands into the Chinese markets. So if you want to surround yourself with those kind of people and marketing and PR firms, then you need to put yourself in Shanghai. Guangzhou is more for export, product manufacturing businesses. Sure, you can of course do your import and sales operations in the South of China, but there are just less people doing it and less options to choose from. Guangzhou is the heart of the Canton area. It has been around for quite some time, and still has a lot of this local culture and feel. For some reason, at least in my experience, there are much less Westerners there. Foreigners love Shanghai and every few Chinese people you will see one or two laowai (foreigners) and sometimes you even forget you’re in China! So if you want a more local China experience, Guangzhou is your choice. Guangzhou is the “heart of the South”. This means that the south’s language, Cantonese, is still firmly planted in the local environment and culture. If you’re looking to learn the official language of China, Mandarin, then you should pick Shanghai. Because in Guangzhou, the locals still insist on using their local and native tongue Cantonese. You as a foreign business person most of the time shouldn’t invest your time learning Cantonese, and it will get in the way of you learning Mandarin. By being in Shanghai you will have submersion to Mandarin 100% of the time. Well, that plus tons of English with the foreigners surrounding you everywhere, but that’s another story. The south of China is just more complicated to learn Mandarin, as there is a lot of Cantonese still used as well as bunch of other local Chinese dialects. If you want a pure “Mandarin Chinese” experience, go to Shanghai. Are you on a Chinese passport visa that needs you to exit every 30 days? Or even 90 days (3 months). Hopping over to Hong Kong counts as that exit, and by living in Guangzhou (or any south China city) you can take a bus or train at a reasonable price without a hassle. But if you’re in Shanghai – there is no choice but to fly out of China. Many of my friends take flights to Philippines or to Thailand. Sure, its a nice excuse to get some beach time – but it will start adding up to your wallet. It was one reason I, as a hustling entrepreneur, picked a south China city. I was on a business visa and had to frequently hop to Hong Kong for the exit stamp. I couldn’t afford (or didn’t want to budget) all those flights in and out of china if I were to be in Shanghai. Because of this, you’ll notice a lot more “corporate job” foreigners in Shanghai and other cities further from a border. That is because they need a proper work visa to stay in the country. Entrepreneurs and small business owners a lot of times will pick southern Chinese cities so they can get their exit/entry stamp cheap and easy with their restricted business visa. Disclaimer – working in China on a business visa is not allowed. A business visa is used for visiting China and earning income outside of China. If you get a salary, you are supposed to file for a proper Chinese employment visa. Use the above risk as reference only and ask a Chinese visa agency for professional help. What do you think – Guangzhou or Shanghai? Those are the main points I can think of. It’s a mix of business reasons as well as lifestyle reasons. What is important to you? 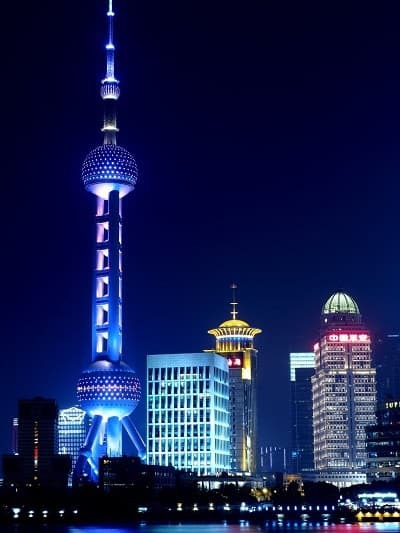 Shanghai is a much more “exotic” place and more people around the world will know that city. And the nightclubs and nightlife in general is much more epic in Shanghai, if you’re in China for that kind of thing. But at the same time, hanging out with foreigners in china is a bit strange wouldn’t you say. You came to China to do business with Chinese – didn’t you? Maybe instead of these big cities like Guangzhou or Shanghai, you can try living in a 2nd or 3rd tier Chinese city. That will be much cheaper, as well as give you a good chance to really submerse yourself in the Chinese language and culture. I wish I did that earlier on in my China business career. good, article I spent I few day in shanghai and the thing you said in this article were clear to my from day one. you can fell the difference in culture and cost. Apologies if I seemed biased in my writeup – I actually live in Shenzhen and go to Hong Kong often – but really every city has its advantages and disadvantages – hard to have the perfect city, in China, or anywhere in the world for that matter.